Young UN New York is the first hub where the initiative grew up before it expanded to other UN locations all over the world. It started in Spring 2016 when a group of young professionals expressed its will to organise brainstorming sessions and turn the dream of improving the UN from the inside into action. The group has increased to reach hundreds of members from all entities represented in New York. 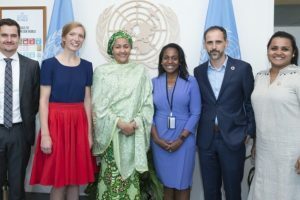 It has met with many Senior Leaders among them, the Deputy Secretary-General, Amina Mohammed, and the Secretary-General’s Envoy on Youth, Jayathma Wickramanyake. The initiative is regularly invited to the Career Development Roundtable conference (2016 in Helsinki and 2017 in Dublin) to share the latest achievements and new ways of collaborating. Young UN New York invites colleagues from the UN family in New York to join the network. If you would like to join as a member or have questions please reach out to young.un.info@gmail.com.